Few trips to new cities begin better than by getting into a cab and saying, “Take me to the racetrack.” Except those in which the cabbie knows exactly where you want to go. 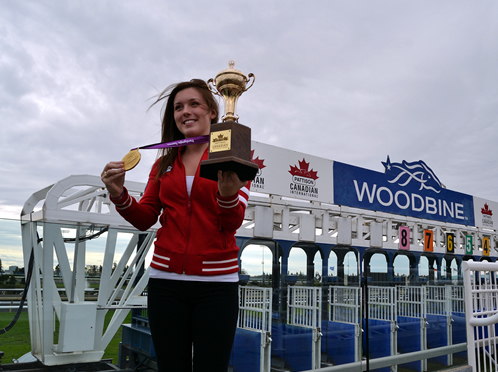 Barely five minutes in Toronto, and I had a great feeling about this weekend at Woodbine for Canadian International day. Swimmer Summer Mortimer, a gold medal winner at the 2012 Paralympics and the guest drawmaster for the International, posing with her medal and the Canadian International trophy after the field was drawn on Thursday. The guest drawmaster is a Woodbine tradition. 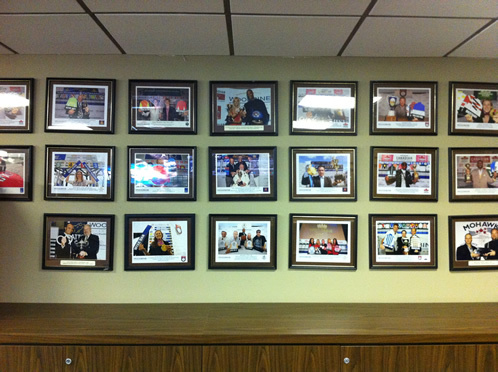 Walls in the press box bar are decorated with photos of notables who took part in past years. Prince Will I Am in his stall. He drew post five in the International, which is his second race following a 15 month layoff. 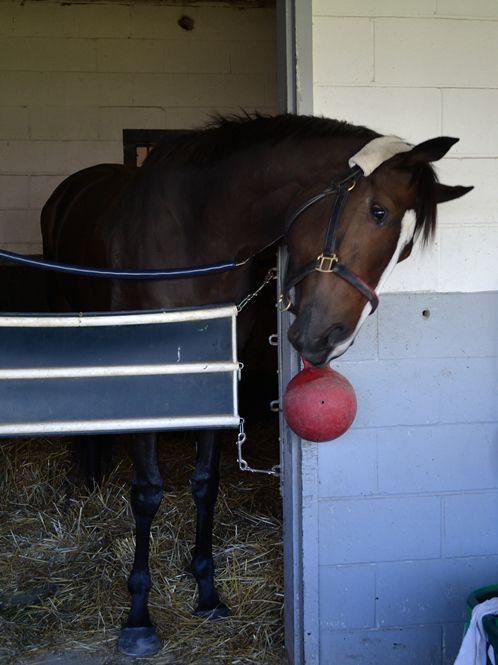 “I am very excited abut him,” trainer Michelle Nihei told the Toronto Star. 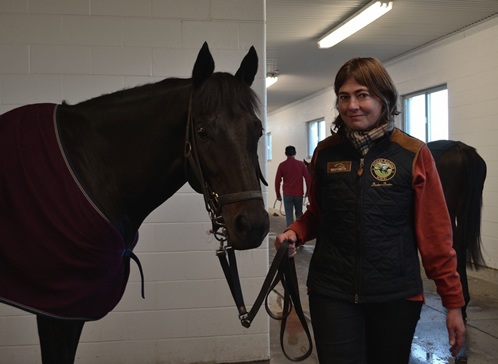 Scalo and groom in the barn where all the European entrants are stabled. The Group 1 winner in Germany is making his third start at Woodbine in the International, in which he drew post four. In his most recent work, a bullet, he worked in blinkers. He’ll be first-time Blinkers On in the International. Stars to Shine, a goofy charmer. She drew post one in the E.P. Taylor Stakes. 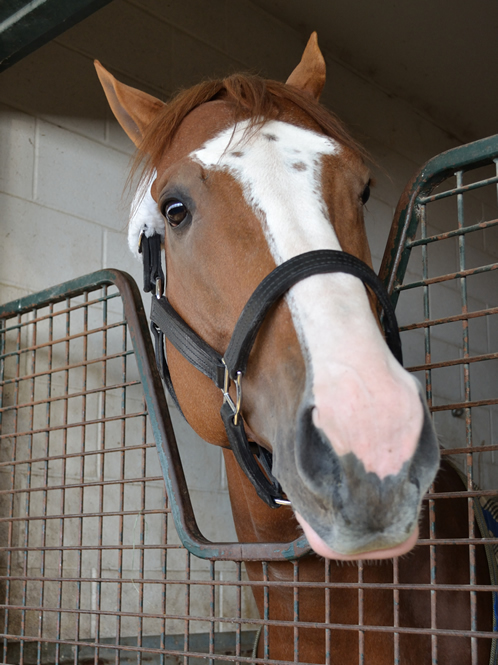 The 5-year-old mare last won the G3 Ontario Matron Stakes in July. 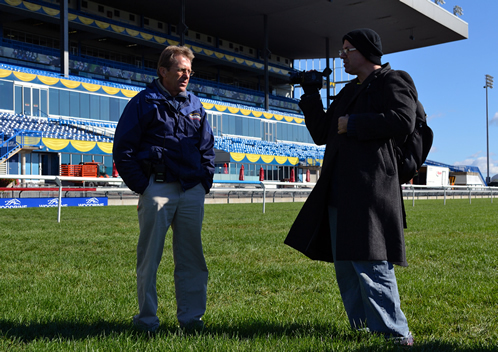 Videographer Ernie Munick is also at Woodbine. Friday morning, he walked the turf course with track maintenance superintendent Irwin Driedger, a former Sovereign Award-winning jockey. The two talked about the condition of the grass (lush) and the peculiarities of the course. 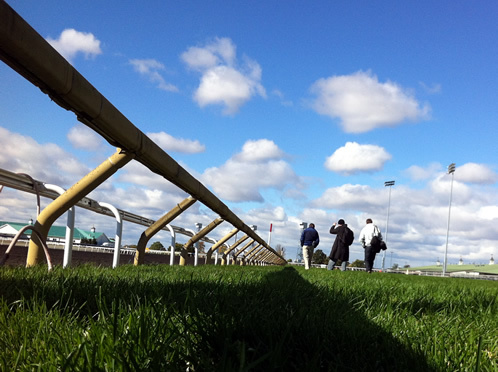 A low-lying view down the turf course from the finish line. 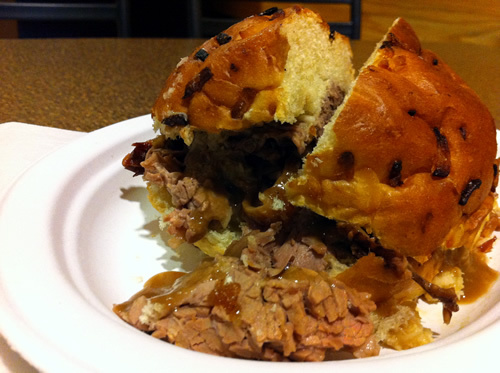 And for a little lunch … Woodbine’s famed roast beef sandwich. Freshly sliced, served with gravy. As delicious as promised.